RGPV (Rajiv Gandhi Technical University, Bhopal) is the best university. Established in the year 1998, by Madhya Pradesh Vidhan Sabha Act 13, 1998. RGPV was established as a common university for all the technical institutes, including engineering and pharmacy colleges in the Madhya Pradesh. The number of students enrolled in the university. It gives the excellent training opportunities to the students and staff. The institutes provide a healthy academic atmosphere. This university gives the chance to the students to present their ideas. Most of the students are placed in good companies. The university gives a good knowledge to the student. This provides all the facilities to the staff and the students. University provides instruction block, workshop, library block, etc. most of the engineers are placed in the foreign countries and doing study further in the foreign countries. External facilities are provided by the RGPV which help students to get better communication skills and because of that the reason. IT industries are ruling in India. Rajiv Gandhi Technical University has courses which can suit anyone. Courses offered Rajiv Gandhi Technical University offers undergraduate and postgraduate full time and online courses. They specialize in fields like Management, Forensic Science, Fashion, Engineering, Space Sciences, Social Work, Nanotechnology, Communication and Pharmacy. At the undergraduate level, admissions are determined on the basis of the Joint Entrance Examination entrance exam. The prerequisite for an entry into a B.E. program is 10+2 years of schooling or a Diploma (10+3). Diploma holders in engineering will enter B.E. courses by lateral entry, which gives them some credit for previous studies. Typically, a diploma holder student joins a four-year B.E. 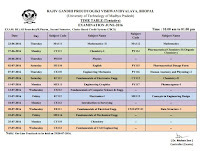 program in the second year of B.E. ; thus the diploma student's years of education (10+3+3=16) are same as those for a non-diploma student (10+2+4=16). At the postgraduate level, the admissions to the Master of Engineering (M.E.) and Master of Technology (M.Tech.) programs are based on the GATE entrance exam. Students applying for the Master of Computer Applications (M.C.A.) program are selected according to their performance on the MP-MCA examination. RGPV TET : RGPV also take an exam i.e. RGPV Teacher eligibility Test (RGPV TET) for those candidates who want to make their future in field of teaching in RGPV University as well as RGPV affiliated institutes. 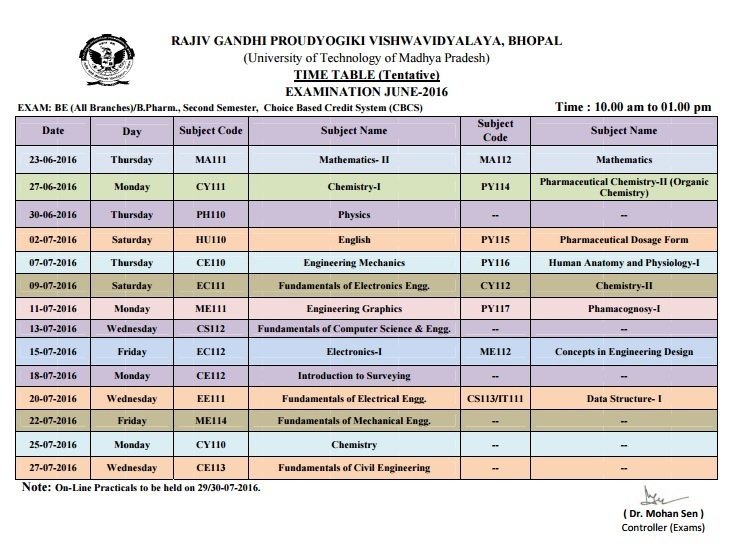 Here we give the detail about RGPV TET form and RGPV TET syllabus of some subjects.